Last year Francisco on the right asked me if I would like to join him and the team he is flying for (TU Dresden) in some Eurotour event and I must admit that I was very glad to get this opportunity to fly in the same team as the best pilots in the world at the moment. Their team spirit and professional attitude is very high and to experience this from the inside was very interesting. I was very glad Axel Freiberg could pick me up from the airport in Berlin. I am also thankful to Holger Au (Contest Director) to stay in their house over the weekend. The contest was held in a relaxed atmosphere and it seemed that all participants was enjoying the contest. 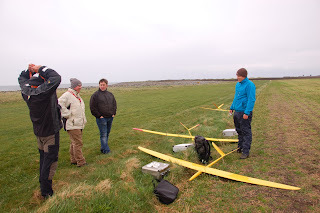 The flying field is very well suited for this activity and it also provides for variable conditions. As mentioned the Dresden Team worked well and they do in fact have an own Team Manager in Reinhard Dylla. This is not something that all teams have of course but from my point of view a big advantage. In this contest also the father of Mike Müller was present and did a good job. I got very good help from all the team and in the end had a good result with 7th. place. Martin Herrig won with Thomas Dylla and Mike Müller on 2nd. and 3rd. place. The weather forecast did not look good for this years Norway Open, nice weather but not so much wind. Luckily the forecast changed the last day and we managed 4 rounds with minimalistic conditions. We are proud to announce that we used our new weather station with great success this day. All flights were measured and we will soon publish the results. We used an average for the flight itself both for wind and direction. All pilots agreed on this new method instead of the old rules. We also agreed that a re flight would be given after the flight was finished if it was ruled under the level and that the pilot could choose either reflight or keep the score. It was quite amusing to see the pilots being more interested in the weather measurements than their times. It is our club member Kåre Aareskjold who have made the weather station. We will look into offering it to others. Slope used was Obrestad south. Windspeed was between 3,1 to 4,5m/s. Fastest time of the day was 66 seconds. The conditions was not super but I think very, very even and to master so little wind is just as difficult as master other conditions. It is not so nice to hear comments like "this is not F3F". F3F is not about the fastest speed, it is about mastering all kind of conditions and slopes. Those who can do that will do well, always. So we had a competition (4 round) and the next day we choose to go to another slope (Austre Bokn) which is much higher and has more thermal influence than the previous slope. This turned out to be a big success with another 8 rounds with pretty good conditions. The weather station was used but since the wind speed and direction was not an issue the results was not so interesting as day one. But we have the data and will publish them soon. Windspeed was between 5 and 9m/s Thermals where coming and going but the variations was not so big. Some pilots did DS circles in the landing area and this was not so popular among the organizing staff. Please let us not see this while we are trying to run a competition. Some pilots had trouble in the landing and got minor damage. Fastest time of the day was 41 seconds. So we had 12 rounds after 2 days and we were very happy with that. Next day did not have a good wind forecast but we could maybe make a round or two. 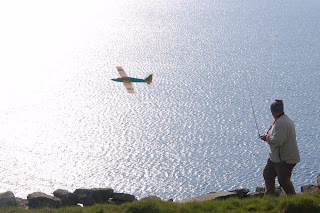 Unfortunately one pilot provoked the Contest Director by flying a DLG on the slope when the organizer was still setting up the course even he was strictly told not to fly. It almost came to a fight between the CD and the pilot and the jury made the decision to call off the competition. This could be seen as a drastic decision but the pressure on the organizer had been built up over the whole weekend and enough is enough. We have always had a non flying rule before the contest start. This was told specific for the last day and when someone chooses to ignore this just to provoke certain people we will and can not tolerate this. Everybody wants to fly before the contest and that can sometimes be solved with a zero round. But we never do a zero round after round 12! If we let everybody fly, time will run and this could effect the number of rounds. One guy asked for a flight to test his newly fixed V-tail, he was not allowed this. A hand launch on the field would have solved this this problem. It was unfortunate that this time we had to cancel the whole day but we still had a good competition. It is really sad that one person can cause so much problems. I would like to apologize to all participants for his behavior. We hope that we can invite to next years Norway Open after we have evaluated this years event. Our sponsor http://www.smartmodel.org/ offered us a Swift EPP model which was won by Kåre Aareskjold. Many thanks to all that helped us during the competition with buzzing etc. Arild is really making it clear what I shall to in the DS circle! Landing approach, it does not look to be but it was. 1st. 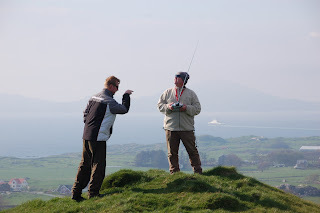 of May should have been a local F3B contest here in my region but bad weather with rain stopped it quickly. Next day was much better and Kjell Gai and me met went to Rennesoy to meet Arild Moellerhaug for some fun flying and F3F practice. Forecast was promising and it turned out to be even better. We all clocked sub 40 times with Arild all the way down to 34 seconds using his Aris. I flew my RaceM and my best was 38 seconds. I did not bring any ballast except my steel joiner so I hope some of the lost time was due to that fact. But Arild looked sharp and I was impressed. 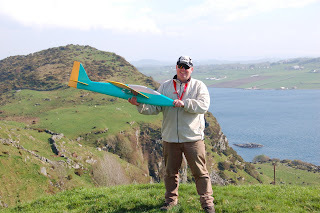 Kjell flew his Brio very well and I think he will move up the ranks this year. I also had the chance to test my RaceM in some rather light DS but rough air DS and it was steady as a rock. I spent the day before to finish my Foxtrot which is an aerobatic model made by some of my friends in Slovakia. This was a very pleasant surprise and both Kjell and me enjoyed flying. I even tested it in DS and it was very easy to control. Landing was not so easy as this slope really demands crow brakes. But I managed so it was all in all one of the best flying days for a long time.